The green fellow at left is distraught because he’s cold, and not all bundled up. Perfectly normal feeling, as a matter of fact. An alternate “Ribos Operation” with Joe E Ross as Binro: “Ooh! Ooh! The Catacombs are full of Shrievenzales”. It’s not good to be this king. Uncomfortable throne, clothing made of drapes and not a buxom wench in sight. If only Gandalf had thought to bring a juggling jester when he visited Theoden. No need to juggle fire. You could probably entertain this Demon Lord with just a laser pointer. Is it a throne or a commode? “Bok” appears to have had an encounter with a great deal of soot in the altogether, if you get my meaning. And the jester appears to be Pansy from “Monty Python and the Holy Grail”, having got a new job. I have no explanation for why the Emperor’s new clothes are made of drapes. Jonathan Pryce, Tim Curry and Hugh Laurie star in King Lear. Serious comment: while it’s a clever idea to have a map in the background, the cover text runs over the map text, which makes it confusing and hard to read. It just feels very sloppy. The position of King Binro’s right hand suggests that he finds Stuart Fell’s fire-juggling really really exciting. Sooty Bok is saying ‘you’ll go blind, my liege’. Less than great balls of fire. @Tat Wood—that’s where the missing “scepter” used to be located! Seems as though he didn’t go blind so much as lost a “limb.” Oh those whacky magickians! 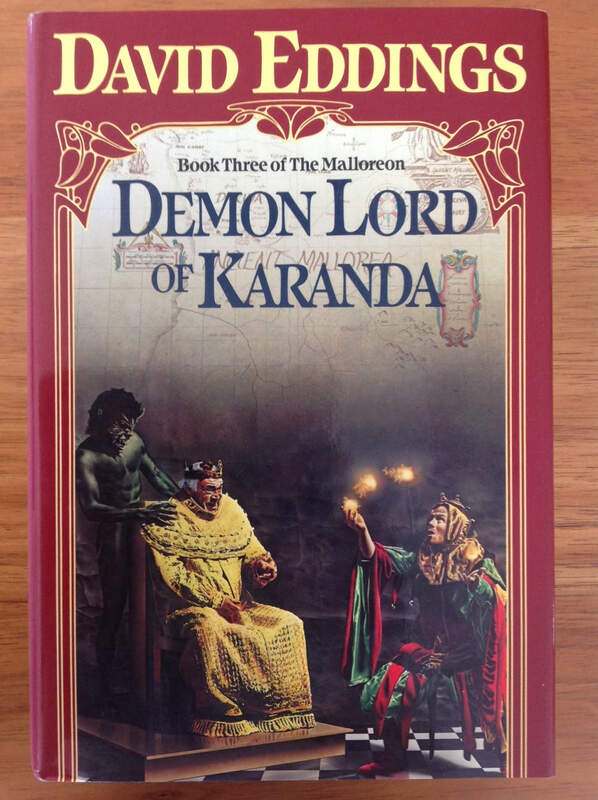 Karanda… Karanda… Just doesn’t seem the right name for somewhere a demon would be lord of, does it? I mean, really, it sounds like it should be a country town in Australia. Perhaps the twist is that the whole story takes place in the deranged minds of the inmates of Karanda Psychiatric Hospital (NSW)? I read this one back in high school. As I recall, it got wet and swelled up to 3 times its normal size. The librarian was unimpressed. @Revellion: yes, but what happened to the book? @Revellion: Did you also feed it after midnight?